The owners of an historic Fylde department store have announced it will close this week with the loss of 60 jobs. 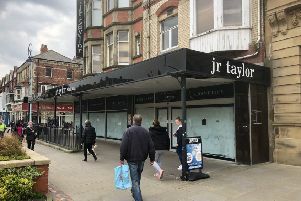 A month after entering administration, management at JR Taylor in St Annes confirmed the independent store, founded in 1901, would close on Saturday. Workers at the retailer, based in Garden Street, were told of the news yesterday, after owners Howjow Investments said the business was “no longer sustainable”. Matthew Bye, a representative of the owners, said: “It is with sadness and regret that we announce this closure. JR Taylor has enjoyed a long association with St Annes and with people from across the county. Mr Bye said administrators Duff and Phelps had had some interest from parties looking to take over the store, but no firm offers had been received. John Moxham, of St Annes Chamber of Trade, said he hoped a new trader would look to take over the building. He added: “I did not think anyone thought it would be saved. “There is still a chance someone might take over the lease of the building, and that is the only thing we can hope for, for someone to come along and reinvigorate the building. Mr Bye confirmed redundancy payments to staff would be paid in full.